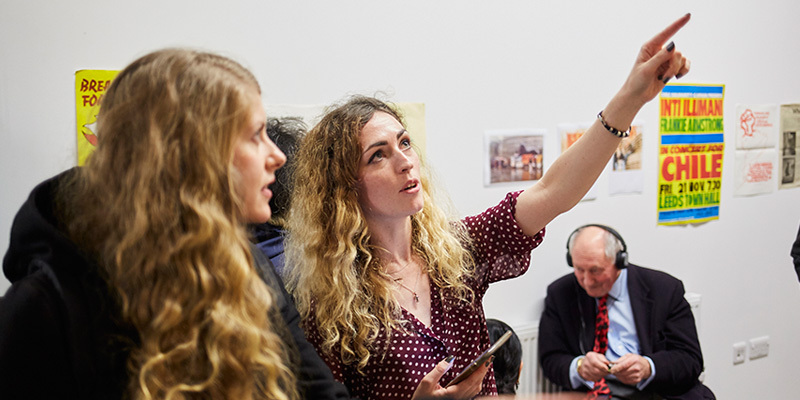 As a postgraduate student in the School of Fine Art, History of Art and Cultural Studies you’ll be able to explore your interests in-depth and develop expertise in an area that fascinates you. Throughout your research degree, and by joining our supportive, multi-discipline community, you’ll gain a broad range of skills to help you prepare for your future career, as well as enhancing your creative and critical thinking. A personalised, individual training plan will be created by your supervisor(s), and you’ll share and discuss your work with fellow researchers and scholars across the campus through the excellent networking opportunities we provide. links to relevant and specialist websites and downloads. You can find more research-enhancing services and postgraduate support at the Leeds Doctoral College. The College organises an annual showcase, which provides you with valuable opportunities for sharing and exhibiting research and receiving feedback. In addition, the Leeds Arts Humanities Research Institute (LAHRI) can also offer support through the Postdoctoral Fellowship, to help you further your arts and humanities-based research and career interests. During your postgraduate studies you’ll enhance your personal and professional skills, and develop connections with staff and fellow students within our welcoming, creative and inclusive research environment. As a postgraduate researcher you’ll be able to access free training sessions in our Organisation Development and Professional Learning (ODPL) unit. Some of these sessions are compulsory, but we also encourage students to explore our other courses. In addition, the University Library offers a variety of facilities, information and support that can be specifically tailored towards your postgraduate research. You’ll also be able to develop your computer skills through IT training, with classroom-based workshops and online resources available to all of our students. Recipients of an AHRC or WRoCAH scholarship will also be able to access various free courses, seminars and conferences that relate to your career and professional development. As a student in our School, you will be able to access further opportunities as part of our lively research community. In addition to ongoing opportunities to attend research seminars, salons and events organised by the School across the year, you will have the opportunity to organise your own events, including workshops, conferences and student-led research groups.We provide funding for an annual conference initiated and organised by postgraduate researchers.Tracing Arguments is a day event for you and your fellow postgraduate students to present works in progress in small peer mentoring groups. Many of our postgraduate researchers are linked to the various research centres based in the School, which allow you to become actively involved in our wider research culture. You will be able to tap into a number of our active postgraduate student-led research groups, or potentially initiate new groups with your fellow students depending on your research interests. The Artist-led Research Group (ARG) is convened by Kerry Harker and John Wright, PhD candidates at the University of Leeds and both active as artist/curators within the artist-led sector. ARG is a voluntary initiative, collaboratively re-examining artist-led initiatives in the visual arts and working towards an international symposium and associated programme in Leeds in the Autumn of 2018. The group is aimed at partners, collaborators and researchers at any stage of their career with an interest in the artist-led field, who would like to contribute time, space, thought and conversation. ARG meetings are scheduled monthly and take the form of a reading group to explore key texts relating to artist-led initiatives. The Artist-led Research Group is focused on generating collaboration and debate, and encouraging dialogue between the University of Leeds and the wider artist-led community. The Art Through Practice (ATP) Research Group is organised by PhD student Zejun Yao alongside Natalie Donohue (School of Education) and aims to promote experiential and embodied ways of knowing and researching in the arts. ATP organises practical sessions that offer both practice-led and research-based scholars from diverse disciplines new insights into their work, whilst simultaneously offering opportunities to expand their research network — cultivating a broad, inclusive research community. The target audience ranges from final year undergraduates through to postgraduate researchers/practitioners, early career researchers and scholars. Diverse and stimulating monthly sessions draw upon the knowledge and skills of each session leader and their extended research network, as well as the combined research experiences of the participants themselves. This allows for a range of opportunities in which participants can engage and relate to their own research journey. This transdisciplinary reading, film and discussion group was co-founded by PhD student Ruth Daly, alongside Dima Chami (School of English), Rebecca Mackin and Dr Sam Perks (School of English). The group aims to bring together researchers to discuss landmark publications and non-canonical contributions alongside current, pioneering work in the fields of postcolonial literature and theory, world literature and world-culture. Beyond the focus on theory, the group shares texts and cultural products to enable us to develop our understanding of major pieces of work, in a creative and stimulating space. This group is aligned with Leeds’ Institute for Colonial and Postcolonial Studies, as well as the Centre for World Literatures. The Postcolonial and World Literatures and Cultures Reading Group was founded in November 2016 and meets several times a semester. All are welcome to join the discussion for intellectual debate and the exchange of ideas in a convivial setting. From the second year of your degree, you are encouraged to apply to become a seminar assistant in our School. This provides excellent experience for your CV and gives you the opportunity to shape the learning experience of our undergraduates. We encourage you to use your own research area and expertise as part of your teaching. A number of our researchers go on to academic careers and postdoctoral fellowships, both at the University of Leeds and across the UK and internationally. You can apply to become an Education Outreach Fellow, working alongside our Arts Educational Engagement Team. Fellows have developed resources and activities to engage young people with higher education and to develop research skills, working in schools, galleries, museums and on-campus events.